BP Psc is a star like our Sun, but one that is more evolved, about 1,000 light years away. New evidence from Chandra supports the case that BP Psc is not a very young star as previously thought. Rather, BP has spent its nuclear fuel and expanded into its "red giant" phase – likely consuming a star or planet in the process. Studying this type of stellar "cannibalism" may help astronomers better understand how stars and planets interact as they age. The composite image on the left shows X-ray and optical data for BP Piscium (BP Psc), a more evolved version of our Sun about 1,000 light years from Earth. Chandra X-ray Observatory data are colored in purple, and optical data from the 3-meter Shane telescope at Lick Observatory are shown in orange, green and blue. BP Psc is surrounded by a dusty and gaseous disk and has a pair of jets several light years long blasting out of the system. A close-up view is shown by the artist's impression on the right. For clarity a narrow jet is shown, but the actual jet is probably much wider, extending across the inner regions of the disk. Because of the dusty disk, the star's surface is obscured in optical and near-infrared light. Therefore, the Chandra observation is the first detection of this star in any wavelength. The disk and the jets, seen distinctly in the optical data, provide evidence for a recent and catastrophic interaction in which BP Psc consumed a nearby star or giant planet. This happened when BP Psc ran out of nuclear fuel and expanded into its "red giant" phase. 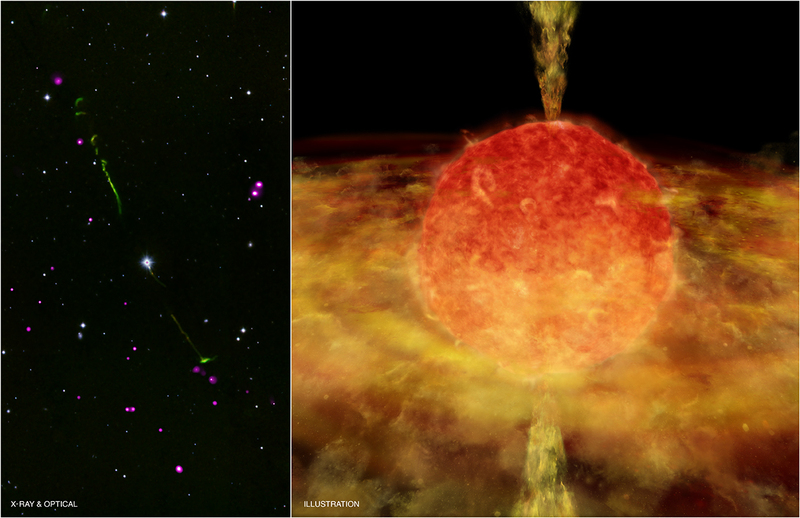 Jets and a disk are often characteristics of very young stars, so astronomers thought BP Psc might be one as well. However, the new Chandra results argue against this interpretation, because the X-ray source is fainter than expected for a young star. Another argument previously used against the possible youth of BP Psc was that it is not located near any star-forming cloud and there are no other known young stars in its immediate vicinity. The Chandra image supports this absence of a cluster of young stars, since multiwavelength studies show that most of the X-ray sources in the composite image are likely to be rapidly growing supermassive black holes in the centers of distant galaxies. Coordinates (J2000) RA 22h 22m 24.70s | Dec -02° 13´ 41.40"
That's incredible when astronomers start looking for possible theories and explanations for a such phenomena I feel like I'm reading Sherlock Holmes. Thanks a lot, everything in the universe is amazing, but I think the most exciting are Red giant and black holes. So thanks for teaching us how fantastic is our universe. If at all possible could you give a man on the street explanation of the theory behind stars having life cycles maybe a paragraph or two three? This is a most interesting article. Thanks so much for the stuff put into this web site. This is really cool, this website's articles are really great with much information that means a lot to an amateur astronomer like me. Wonderful illustration. I always look for Melissa's illustrations as they are always so great. BP Piscium (BP Psc), a more evolved version of our Sun. About 1000 light years from Earth. 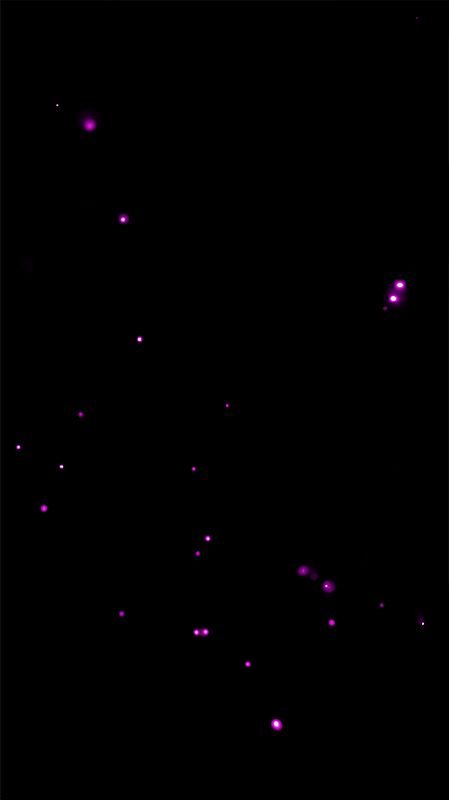 X-rays from Chandra X-ray Observatory data, and optical data from the 3-meter Shane telescope at Lick Observatory. X-rays are purple and the optical data are orange, green, blue. In the constellation Pisces, visible from both Hemispheres.